Holding Our Own provides training on various topics affecting children and families. Our services can be enlisted for staff training, conference and workshop presentations, as well as, community and parent education. 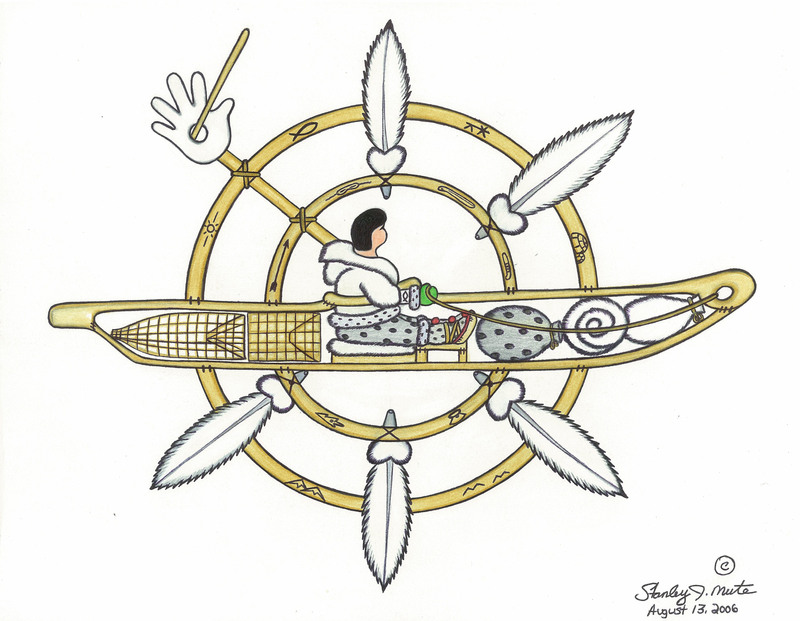 Sandy Kleven has been a speaker at national gatherings of Systems of Care grantees with the Children's Mental Health initiative through SAMHSA (Substance Abuse and Mental Health Services Administration) and National Indian Child Welfare conferences. Her work in education for abuse prevention has won awards. 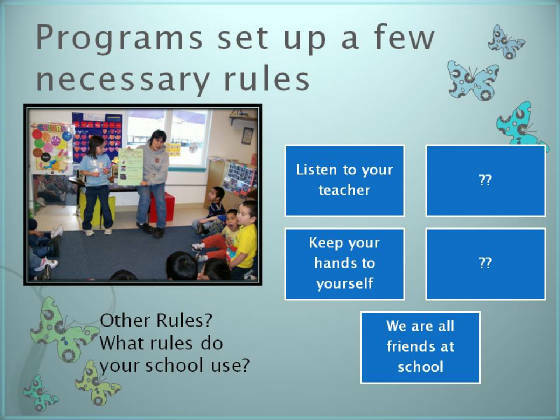 "try this instead" how to avoid "no," "stop" and "don't"
working with children impacted by fetal alcohol exposure. helping sad children -- is it depression, trauma or SAD? Please scroll down to request more information. 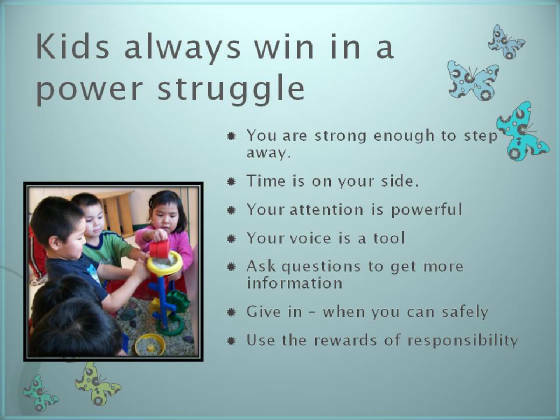 Slide (below) from a pre-service training for Head Start educators. "Sandy helped with great suggestions on how to address a challenging child." "To be honest, everything was useful to me. I thought of some wonderful ideas to use for a little boy who won't participate in any physical activity besides actually being outdoors." "This presentation was very useful." "The biggest thing to me is how to work with challenging behaviors...Also, the part when you spoke about not pushing the kids into doing what you want but instead taking the time to find out why the child is resisting." "I enjoyed the lecture on inclusive classrooms where all are part of the whole and the advice to 'stay away from power struggles' because the child will always win." Slide (above) used in staff training. Communication in language clear to teachers, parents and other staff. Experience specific to Alaska, both urban and rural. Cultural knowledge and proven ability to work effectively with diverse populations. Please use the form below to request more information.